The 4-star wellness hotel Aranyhomok is situated on the historic main square of Kecskemet. The wellness hotel offers 111 renovated rooms, an air conditioned restaurant and a brand new wellness centre where swimming pool, sauna, jacuzzi, gym, special massages and treatments await the hotel guests. The „puszta programs” are excellent tourist attractions in the region. The renewed Hotel Harom Gunar, situated in the heart of Kecskemet, awaits its guests with spacious, newly created and renovated rooms and a wellness area. The 4-star hotel offers perfect accommodation solution for both business and leisure travellers. The rooms have air conditioning and free WiFi Internet access is available in all areas of the hotel. 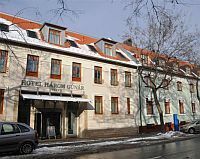 The menu of the restaurant of Hotel Harom Gunar offers a wide selection of traditional Hungarian dishes as well as dishes from the international cuisine and - following the traditions –a wide range of goose specialities. The family atmosphere Wellness Hotel KAKADU ***superior is located in Keszthely, only 350 m from Lake Balaton. Wellness Hotel KAKADU ***superior – open throughout the whole years offers to its guests 28 rooms, 4 apartments – all with WiFi Internet connection - and an own wellness club which assures the possibility of health preservation and the refreshment of body and soul. 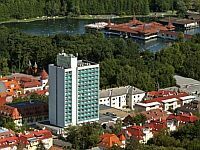 The hotel is an ideal starting point for numerous excursions, visitors might get enchanted by the historic atmosphere of Keszthely, the architectural and cultural heritage and at the same time by the wonderful natural surroundings. The lake of Heviz, the largest natural thermal lake of Europe, can be reached in 10 minutes by car from the hotel. The 3-star Hotel Irottko, located on the main square of Koszeg, awaits its guests seeking relaxation and rejuvenation with 50 rooms and a wellness department. The wellness services of Hotel Irottko *** and the crystal clean air of Koszeg ensure total renewal. 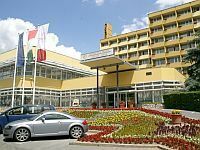 The hotel in Koszeg is an ideal venue for conferences, weddings, balls and concerts. The historical town situated at the foot of the Alps offers several programmes and sights for tourists. The newly built 3-star Balneo Hotel Zsori Thermal & Wellness is located in Mezokovesd near Zsory Spa and Open Air Swimming Pool where curative pools, experience pools, wave pool, round pool with waterfalls and natural massages, children’s pool and indoor swimming pool are at guests’ disposal. In the hotel air conditioned rooms, Balneo therapy-centre and wellness-fitness services ensure that our guests are satisfied, physically and mentally refreshed, rested and cured when they leave. 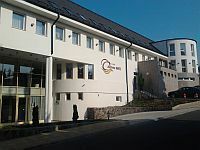 The 3-star Kikelet Club Hotel is situated in the centre of Miskolctapolca, only 500 m far from the Europe-wide unique Cave Bath and 10 minutes far from the centre of Miskolc. Our apartment hotel offers 18 apartments with big floor space and American style tea-kitchen. 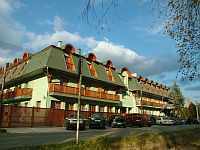 We offer our apartments to big families, fellowship of friends and groups. Our Bonfini Restaurant’s menu card offers a range of meals involving Hungarian and international gastronomy with careful attention to the traditional and modern trends. Colosseum Hotel **** superior is located in Morahalom directly connected to the Szt. Erzsebet Medicinal Spa. Colosseum Hotel awaits its guests with elegant rooms of different room categories meeting all the requirements, an own restaurant, spa and wellness department as well as a conference room for 150 persons.